Maryland 2019 Strawberry Festivals - Where, When and More Details! Looking for a strawberry festival in Maryland in 2019? (just scroll down the page)There is no other listing as complete and current as this list, just updated! All the strawberry festivals in Maryland we can find are listed on this page! If you love strawberries, look for a festival near you below! And I'm always looking for more strawberry festivals! Please write me, if you know of any to add! I update the dates as soon as the festivals publish their information, but you can always click on the links (usually the name of the festival) to see the current information on the festival's own website. 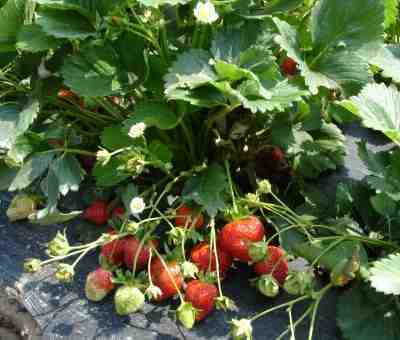 Adelphi Strawberry Festival - Saturday, early June from 10 am to 3 pm. Ann Arrundell County Historical Society Annual Strawberry Festival - Saturday, June 8, 2019 from 10 am to 4 pm. (Rain date is June 5th. Benson-Hammond House, Linthicum, MD 21090. Phone: 410-626-1437. Email: [email protected]. Celebrate All Things Strawberry and Anne Arundel County's Agricultural Heritage. The Festival will include quality crafts, demonstrations, strawberry wine and shortcake and entertainment for both children and adults. For additional information call Becky Morris. 2019 is the 29th Annual Strawberry Festival It’s once again time to celebrate all things strawberry! The festival runs from 10:00 a.m. to 4:00 p.m. on the grounds of the Benson-Hammond House. Come enjoy music, crafts, food, wine and our famous strawberry shortcake! Rain date: June 9. 819 West Central Avenue, Davidsonville, MD, 21035. Phone: 410-798-5511. Email: [email protected]. Join us for our annual Strawberry Festival, Saturday, May 18th 11 AM - 2 PM. Free event, all are welcome! Food and treats to purchase including: strawberry shortcake, smoothies, strawberry pie, homemade baked goods, cheesecake, Tongues of Fire BBQ! Local crafters & vendors will be on site selling goods. We will also have a variety of FREE kids activities for families. The Sykesville Freedom Fire Department, 6680 Sykesville Road (Rt. 32), Sykesville MD 21784. Phone: 410-795-9174. Email: [email protected].. The festival is held rain or shine.It has been held for 27 years. They have strawberry shortcake, games, pony rides, entertainment, a silent auction, food, craft sales, antique vendors, and more. Potomac United Methodist Church, 9908 South Glen Road, Potomac, Maryland 20854. Phone: 301-299-9383. Email: [email protected]. More info and updates: Click here for a link to our Facebook page. Martin Sutton Memorial Park, Ridgely MD. Phone: 443-786-2547. Email: [email protected]. This annual event is the largest fundraiser for the Ridgely Lions Club. The festival kicks off at 9am with a non-denominational church service led by the Fish Locker Ministries. Also starting at 8am is the 8th Annual Strawberry Chase 5K Run/Walk. All proceeds from the Strawberry Chase are donated to support the Maryland Ronald McDonald House and the Caroline County Super Summer Day Camp. You can pre-register on-line at www.carolinerecreation.org for the Strawberry Chase 5K Run/Walk. At 10am the festival gets into full swing with musical entertainment, food and craft vendors open for business and the children's entertainment area opens. At noon the Strawberry Festival Parade kicks off on Bell St. and ends at Martin Sutton Park. If you'd like to participate in the parade contact Lion Jerry Sutton at 410-634-2129 or at [email protected] . The afternoon continues with raffle drawings, awards for the best parade entries, and presentation of the 2018 Ridgely Lions scholarships. If you're looking for a day filled with good wholesome fun, delicious food and entertainment, then the Ridgely Lions Club's 39th Annual Strawberry Festival is the place to be. For more info about the festival go to www.facebook.com/ridgelylionsclub . 17901 Bentley Road, Sandy Spring, MD 20860. Phone: 301-774-0022 . Email: [email protected]. Directions: Click here for a map and directions. the 37th Annual Strawberry Festival. The museum's grounds are transformed into a fun-filled community fair with live music and entertainment, food trucks, a beer garden, and activities for children of all ages. Over the years the Strawberry Festival has featured a rock climbing wall, pony rides, a petting zoo, and much more!This year's event will go down in history, with an enhanced lineup of music, food and fun, featuring: LIVE MUSIC, 10 FOOD TRUCKS, FUN. Rock Climbing Wall, Moon Bounce, Pony Rides with Reddemeade Equestrian Center, Face Painting, 4-H Petting Zoo, Indoor and Outdoor Craft Villages, Garden Club Plant Sale, + much more! Fresh local strawberries, World's best strawberry shortcake, Strawberry-inspired delights, Chocolate-dipped strawberries + Teen bands, Magician, Karate demonstrations, Dance performances on the Community Stage, sponsored by Studio of Ballet Arts. 2016 ADMISSIONS $3/person, $10/family, $15 unlimited play wristbands, Buy today and save $5 on wristbands! Get your wristbands now. St Luke's United Methodist Church, 304 S. Talbot Street, St. Michaels, MD 21663. Phone: (410) 745-2534. Email: [email protected]. The festival will take place on the first Saturday of June on the lawn and the parking lot of St. Luke's U. M. C.. Our Annual Strawberry Festival is fun for the whole family. You can shop our many craft vendors and purchase fresh asparagus and of course, strawberries. There are baked goods including incredible strawberry shortcake. Sykesville Messiah Lutheran Church Annual Strawberry Festival - Saturday in Easrly May from 9 am to 4 pm. Sykesville Freedom District Volunteer Fire Dept. Grounds, Rt. 32 and Freedom Ave., Sykesville, MD. Phone: 410-795-9174. Messiah Lutheran Church invites one and all to our 28th ANNUAL STRAWBERRY FESTIVAL, Saturday, June 2, 2018This will be an affordable fun filled day for the entire family. In addition to fresh picked strawberries and homemade strawberry shortcake we will have many games and activities for children, face painting, hay wagon rides, and pony rides. There will also be a Silent Auction with gift baskets, gift cards, and more to bid on. Entertainment will be provided throughout the day. We will also have over 50 craft and flea market vendors displaying their merchandise. Wood crafts, jewelry, crystal sun catchers, paintings & tapestries, crocheted items, children’s items, dolls & doll clothing, candles, baskets, flowers, collectibles and many other crafts will be for sale. The flea market vendors will be offering a wide assortment of useful and desirable items. A variety of foods will be available all day, starting with breakfast sandwiches at 9:00 am. Visit our baked goods booth to purchase your favorite sweet treats. Admission is free and there is plenty of parking. For vendor information call 443-201-8077..
Warrior Run Church is 41 Warrior Lane, Watsontown, PA 17777. Email: [email protected]. FREE Admission! ~ FREE Parking. Fun for the Whole Family since 1980. Lots of Things To See and Do: Family Event featuring homemade food and ice cream, Strawberry Desserts made from local berries, Hamburgers, Hotdogs and our legendary Ham Barbecue, Musical Entertainment, Exhibit of Antique Cars (by Chapters of the AACA), Old Fashioned Hymn Sing accompanied by Pump Organ featuring John Ravert and students. Tours of the Church and Cemetery. Heritage Society books and memorabilia for sale. NOTE: Proceeds from this event help pay for restoration of the Historic Warrior Run Church and the Hower-Slote House. 11453 Long Green Pike, Glen Arm, Maryland 21057. Phone: (410) 592-8303. 3978 Littlestown Pike, Westminster, Maryland 21158. Fresh Strawberries, Ice Cream, Fried Chicken, BBQ, Hot Dogs, Hamburgers, Cheeseburgers, Chips, Chicken Corn Soup, Chicken Salad, Sodas, Coffee, Tea and Bottled Water. Make your own platter includes fried chicken, green beans, baked beans, potato salad, applesauce & roll. Baked Items, Handmade Crafts, Plants, White Elephant Table. 2716 Old Washington Rd, Westminster, MD 21157. Phone: 410-259-5143. Email: [email protected]. Crab cakes and chicken platters, sandwiches, strawberries & ice cream, blue grass music. Church is located south of Westminster, off Route 97 at Nicodemus Road.